Carved , Hollowed , Polished ? L = 105.9, embouchure exterior L = 30, W = 21.4, internal diameter embouchure = 16 by 15 mm; external diam finger-hole = 6.2, internal diam finger-hole = 5.5 mm [RTS 26/1/2005]. Small notched end-blown flute carved from the tip of an antelope horn and hollowed out. This consists of an oval embouchure, slightly notched on either side and cut flat across the top, and showing only minimal use wear. The body curves slightly below, tapering in towards a narrow finger-hole at the distal end; this is round in section, and very thin walled. The object is complete, but the surface is pitted and damaged in places; this appears to have been polished, and is currently an opaque dark brown colour (Pantone 426C). It has a weight of 15.9 grams, is 105.9 mm long, and has an embouchure that measures 30 by 21.4 mm across its outside edges, and 16 by 15 mm across the inside opening, while the finger-hole has an external diameter of 6.2 and an internal diameter across the opening of 5.5 mm. Collected by Percy Horace Gordon Powell-Cotton and his wife Hannah at Loronyo on 17th April 1933, during a shooting expedition. This type of flute was said to be used by a boy. They did not record its Lotuko name. Accession Book Entry [p. 248] 1934 [insert] 8 [end insert] - MAJOR P. H. G. POWELL-COTTON , Quex Park, Birchington, E. Kent. Specimens collected by himself & Mrs Cotton, during hunting trips, 1933, viz: [...] [p. 252] - From the LATUKA tribe, NAVERA, TORIT, LARONYO. [p. 256, insert] 87 [end insert] - Single syrinx whistle made from the tip of an antelope's horn, with terminal stop. LARONYO. (615). Additional accession book entry [p. 255] 1934.8.87. Number given HLR. Related Documents File - Typewritten List of "Curios Presented to Dr. Balfour by Major & Mrs. Powell-Cotton. Latuka Tribe". 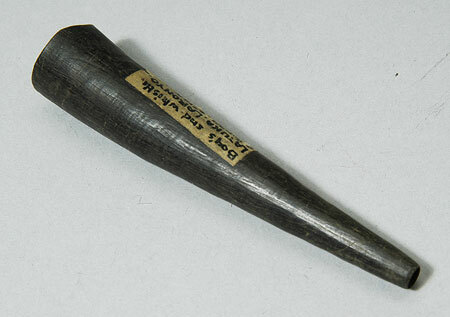 This object appears as item 615: "Boy's horn whistle, 4 1/4" long, blows down end, 13/4/33 Laronyo 4.38 N 32.37 E”. Also contains details of a cine film 'some tribes of the Southern Sudan', taken by Powell-Cotton during this 1933 expedition, copies of which are now in the National Film and Television Archive and the Powell-Cotton Museum in Kent [RTS 14/3/2005]. Old Pitt Rivers Museum label - Boy's end-whistle. LATUKA, LARONYO. E. SUDAN. 4° 38 N., 32° 37' E. d.d. Major Powell-Cotton, 1934 (615) [on paper label stuck to surface of object; RTS 2/12/2004]. Sparks, Rachael. "Lotuko flute" Southern Sudan Project (in development). 03 Jan. 2006. Pitt Rivers Museum. <http://southernsudan.prm.ox.ac.uk/details/1934.8.87/>.